How do you use Any in Swift? What’s the difference between Any and AnyObject? And when and why should you use them? We’ll answer those questions in this tutorial. Why Use Any And AnyObject? This type Int is specific – we’re very clear here about the fact that age is an integer number. What’s going on here? It doesn’t make sense at first glance – how can the values array contain multiple different types, such as Int and String? That’s because the type of the values array is nonspecific, it is [Any] or array-of-Any. In the above code, we’re using a for loop to iterate over the items in the values array. For every item we’re executing a switch block. This switch block matches the type of value with one of three cases, using the type checking is keyword. In essence, we’re checking the type of each of the items in array, and writing some text based on this type. If you’re unfamiliar with type casting, now’s a good time to read up on that. Type casting, Any and AnyObject are closely related, because you’ll almost always want to type cast a variable or constant with type Any or AnyObject to a specific value type (such as in the above example). Consider that programming is often nothing more than taking some input, processing it, and providing that as output. You’re writing code that downloads tweets from an API, manipulates that data, and shows it to a user in a UI. It then makes sense for the Swift programming language to provide tools and features that make dealing with data easier. Optionals, generics, protocols, type casting, Any and AnyObject – all of those “tools” help you process data more effectively. And they (usually) make your code clearer, more expressive, and easier to extend and maintain. See how this dictionary mixes values of different types? The first value is a string, the second an integer, and the third an array of strings. Thanks to Any we can combine these different tweet values in one dictionary. We don’t need a custom class or type for the tweet, or use multiple values and dictionaries. And that’s super useful! So far we’ve only looked at Any. How is Any different from its close cousin, AnyObject? Simple enough, right? You use Any for anything and AnyObject for classes. But… there’s more! First, it’s important to understand the difference between value types and reference types. In short, a value type is copied when you pass it around in your code, and a reference type is not. Classes are reference types, and passing those around in your code merely creates a reference to the original object. 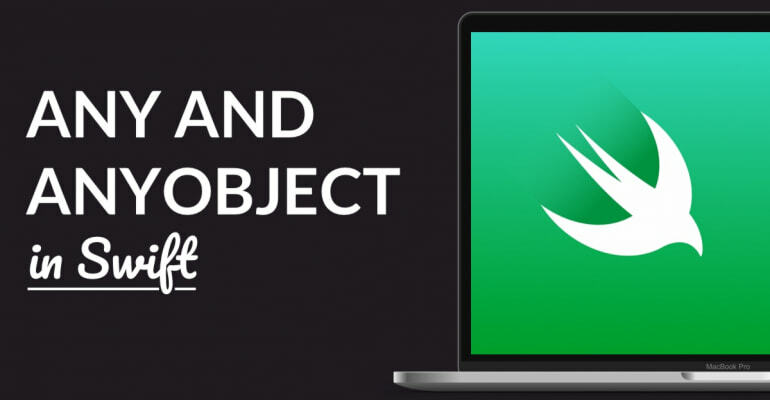 Second, it’s crucial to understand the role of Objective-C, Swift’s predecessor, in Any vs. AnyObject. In Objective-C you can use the polymorphic, untyped id pointer to refer to any kind of object. Much like Any and AnyObject in Swift. In Objective-C, all objects are reference types†. They’re accessed via pointers, and Objective-C doesn’t have the concept of a value type. This is an important point! One of the great features of Swift is its interoperability with Objective-C. You can use Objective-C code in Swift projects and vice-versa. And you can use SDKs written in Objective-C in your Swift projects. Neat! This interoperability relies on bridging Swift types and Objective-C types, among other things. The Objective-C type NSString, for example, is bridged to the Swift type String. As a result, you can (almost) seamlessly work with strings between the two languages. In Swift 2 and earlier, importing to Swift from Objective-C had a problem. Before Swift 3, Objective-C’s id type was imported as AnyObject. Any value of type id that’s passed from Objective-C to Swift had the AnyObject type in Swift. Remember that AnyObject can only works with classes? This implies that AnyObject is a reference type. Objective-C doesn’t have value types, and id is a reference type, because it uses pointers. And that has a huge disadvantage: you can’t benefit from Swift’s value types when interoperating with Objective-C’s id. Simply said, importing Objective-C’s id into Swift as AnyObject means you can’t benefit from value types in Swift. And that’s where Any comes in. Since Swift 3, Objective-C’s id is now imported as Any in Swift. This change is more complex than what’s described here – because it affected bridged and unbridged value types, generics, and collections with AnyHashable. When should you choose one or the other? It’s a good practice to use AnyObject when working with classes, and Any when working with value types. As we’ve seen in the previous examples, an array with integers and strings should use Any because they’re value types. You can use Any with classes, but it’s better to use AnyObject. In any case, don’t use Any when you don’t want to provide a value’s type. It’s important to only use Any and AnyObject when you explicitly need the behavior and functionality they provide. Otherwise you’re just creating needless ambiguity in your code! Note: Some blogs, articles and forums still mention Objective-C’s id as being imported as AnyObject in Swift. This is outdated information. † With the exception of NSString, NSNumber, etc. because they define object equality as something different than pointer equality. Swift’s Any type proves useful when you want to work with nonspecific types, for example in arrays and dictionaries. In this article, we’ve discussed the difference between Any and AnyObject and why that’s relevant for iOS developers today. And we’ve seen how type casting can be used to effectively work with Any.